All the power of gas but with a 62V fuel cell that lets you trim and mow for up to 40 minutes on a single charge! The powerful 850W brushless motor is so quiet you can mow any time of day without disturbing your neighbors. Ultra light (just 45 lbs) for easy maneuvering. World’s 1st Battery Powered Trimmer Mower! DR invented the gas-powered “trimmer on wheels” and now, over 30 years later, we are proud to introduce the first ever battery—powered model–bringing you all the power of gas with the convenience of clean, quiet, battery power. The PULSE–62V will mow for up to 40 minutes on a charge (the equivalent of a tank of gas) and, with an extra fully–charged battery on hand, you can double that and work for up to an hour and 20 minutes. Best of all—no gas, no fumes, no fuss! 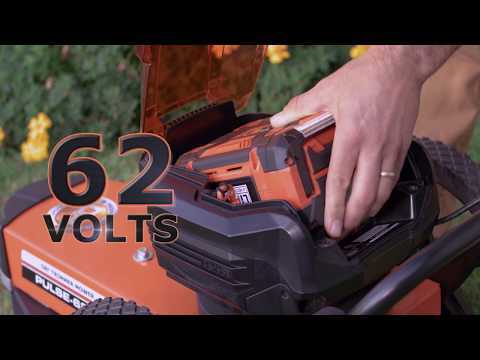 Our lightest model (just 45lbs including the battery), the PULSE–62V is ideal for trimming and mowing in tight quarters where maneuverability is most important. For short bursts, the PULSE has all the muscle you need to take down thick grass and weeds as well. However, for sustained mowing in heavy growth, we recommend choosing one of our gas-powered models. The PULSE uses a customized version of our Quick– Lock Trimmer Head which offers the easiest to use and fastest cord changing system available. Adjustable cutting height: 2" to 4"
The performance of gas with the convenience of clean, quiet battery power! Trim and mow for up to 40 minutes on a single charge. Add an extra battery to your order so you can have a freshly charged one ready and you'll DOUBLE your run time! (Select either 1 or 2 batteries at the top of this page). is customized for the PULSE 62V model. Allows you to change your trimmer cord in just seconds - completely hassle-free! Cord is simply inserted into the head and is anchored in place by the unique gripping mechanism! Perfect for quick cord changes in the field. on a single charge of the 5.0 Ah battery. Add an extra battery to your order and you can have a freshly charged battery ready to go and work for almost an hour-and-a-half! means no arm-yanking pull starts! is energy efficient and MUCH quieter than a gas-powered mower. It's even quiet enough to cut the grass any time of day without disturbing your neighbors! saves valuable space in your garage or shed. This trimmer couldn't be easier to use! It's powerful, lightweight, and starts with just the push of a button. The Quick-Lock head is another convenient feature, I just carry a few extra pieces of cord with me and change it in seconds. I couldn't be happier with my purchase and highly recommend it! I'm also planning on purchasing a couple of the 62V hand tools that are powered by the same 62V battery. A great addition to two solid line-ups! When most people think of DR Power, they think of their Trimmer on wheels. Now they've taken those wins and added a battery-powered motor, making a light, versatile machine. The other smart thing about this unit is that the battery can be used in any of the 62-Volt hand tools. One battery that will work in several tools, you can't beat the convenience of that! The battery lasts about 40 minutes in light grass. The battery will recharge in 90 minutes. I was trimming in a larger area and needed a little extra time. I just chraged up a second battery while I trimmed, it was ready when I needed it! The DR Pulse Trimmer is so easy to use! It's nice to not have to worry about gas and oil for another machine. There is no struggling to get the Trimmer started. Because of its size and weight, it is light and maneuverable. You have all the benefits of the gas-powered Walk-Behind Trimmer with the added benefits of a battery operated motor. This is the perfect Trimmer for someone that has light weeds and grass growing around their house and is tired of dragging a heavy hand-held around. Q.Can I use the thicker DR cords with the Pulse? A.Thank you for your interest. You can use a thicker cord with the DR Pulse Trimmer. Be aware that the thicker cords will create more draw on the battery and reduce runtime, but the 2-Cord Quick Lock Head will accept cord up to 225mil. Q.Why is the cutting width less than the cutting width of the gas models? A.Thank you for your question. The slightly shorter and thinner cord specified for the DR Pulse Trimmer reduces battery consumption without sacrificing the quality or power of the cut. You can choose to use a longer cord, but it will reduce the runtime. Please feel free to contact us if you have any other questions. Q.What is the runtime on a battery charge? A.The DR Pulse Trimmer will run for up to 40 minutes on a charge. Actual runtime will vary with the type of material being cut. One tip for prolonging the battery life: rather than grounding the trimmer head as you walk, apply just enough downward pressure on the handlebars to lift the trimmer head slightly off the ground. This will reduce friction and extend your runtime. Please let us know if there's anything else we can help you out with. Q.Does the Pulse have as much power as the gas models? A.Thank you for your question. The RPMs are the same for the DR Pulse Trimmer and the gas models and the cutting power is equivalent. However, heavier growth will draw down the battery quicker. For sustained mowing of heavy growth, we recommend choosing a gas-powered model. Please let us know if you have any other questions. Q.Can I use the 2.5 AH battery on this unit? A.Thank you for your interest in the DR Pulse Trimmer. You can use the 2.5 AH batter on this unit. The runtime will be approximately half of what is delivered by the 5 AH battery. Please feel free to contact us again if you have any other questions. Q.Is the Quick-Lock that comes with the Pulse an option for the gas-powered models? A.Thank you for your question. The custom Quick-Lock head on the DR Pulse Trimmer is only available when purchasing the Pulse model. It cannot be used on a gas-powered model. Please let us know if you have any other questions. Q.Why is the Quick Lock included on the Pulse but not on the other models? A.Thank you for your question. Our DR Pulse Trimmer uses a custom version of the Quick-Lock Head. The other walk-Behind models come standard with the widebody Trimmer head and can be upgraded to the standard version of the Quick-Lock Trimmer Head. Please feel free to contact us if you have any other questions.